High initial adhesion and long term holding power for reinforcing, strapping and non-RSC box closing. Transparent backing provides excellent abrasion, moisture and scuff resistance. 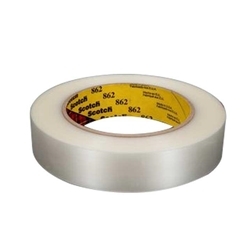 High tensile strength ensures a tighter hold with less tape. Resists breaking or tearing even if nicked or punctured during handling. Multi-layer adhesive system prevents separation of filaments from backing.